In the last two posts, we have discussed the properties of reflection and formalized our learning by enumerating the Reflection Postulate. In this post, we use the Reflection Postulate to prove the Perpendicular Bisector Theorem. The theorem states that given a segment, its perpendicular bisector, and a point on the perpendicular bisector, the endpoints of that segment is equidistant to the point on the perpendicular bisector. That is given segment AB, perpendicular bisector l, and point P on l, then PA is congruent to PB. The reflection image of point P over line l is P itself. This is by the definition of reflection. The reflection image of point A over line l is B. This is also by definition of reflection. 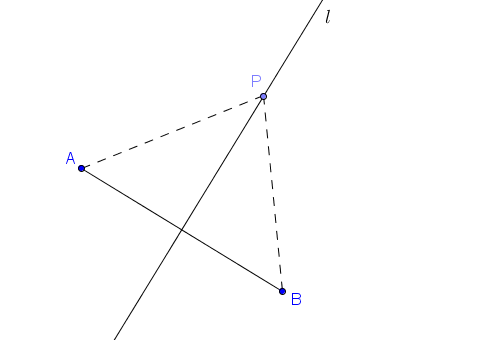 PA is congruent to PB since reflections preserve distance (by Reflection Postulate).